A busy weekend is coming up for a lot of us with plenty of people wanting to take advantage of the long, holiday weekend. Luckily, Mother Nature has provided us with some pretty good weather for the weekend - it may even feel a little summer-like still. Happy Friday everyone! Things appear to be somewhat similar today to yesterday's conditions with highs near 90 and a chance of showers and thunderstorms. The good news is that storm coverage this afternoon/evening shouldn't be as high as it was yesterday. Some high resolution models show this scattered nature of storms later today. Any showers and thunderstorms that develop this afternoon should begin to lose strength shortly after sunset. Temps will remain in the 80s through the evening hours for all of those with plans to head out to high school football games. For all of those with plans to take advantage of the long weekend, you are in luck! Besides some slight afternoon shower chances, the majority of the day should be filled with plenty of sunshine. Highs will remain in the low 90s, but a nice breeze each day could help. If you will be out tailgating on Saturday for the Memphis Tigers season opening football game, you'll definitely want to have plenty of water and sunscreen! Recall the UCLA game last year? Yeah, it was hot... Same goes for the USL soccer exhibition at AutoZone Park on Saturday. Sunday will likely be the warmest day of the weekend with heat index values nearing 100. If you do plan to be outside for prolonged periods of time, be sure to stay hydrated. In short, next week will be pretty boring with highs in the lower 90s, lows in the lower to mid 70s, and minimal rain chances each day. For those of you that want a quick forecast, there it is. For those of you interested in learning why this is happening, let's get geeky - read on! First things first, high pressure influences will be our friend next week. The map shown below represents mid-level flow (about 18,000 feet up in our atmosphere) averaged over a 5-day period from Sunday-Thursday. 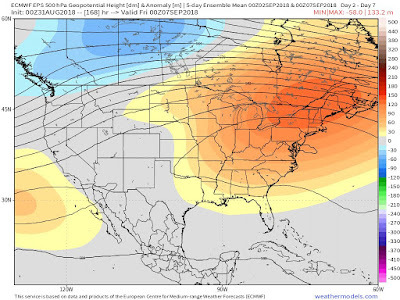 The average pressure pattern is shown by the solid black lines with a large high pressure system over the eastern U.S. Warmer colors, such as orange and yellow, mean a positive pressure anomaly (above normal pressure) whereas the cooler colors, such as blue, mean a negative pressure anomaly (below normal presure). I know, it's a bit complicated. Essentially, areas with these "warm colors" means that average heights will be higher than normal through the period, which is correlated with high pressure. As you can see, these higher height anomalies are set up over the eastern half of the U.S., with our area feeling these influences. So how does this translate to what we will see? For us, high pressure usually means near to above average temperatures depending on the set-up and rain chances kept to a minimum. Taking a look at a few additional resources, we see that this is the case. 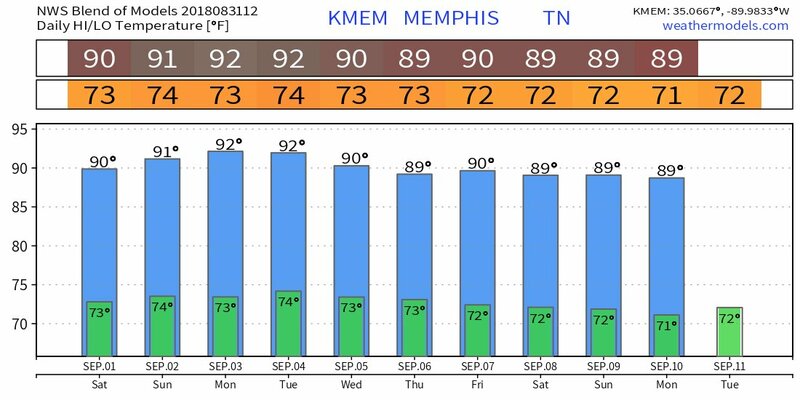 An NWS ensemble (basically a combination of a bunch of individual models) forecast shows highs near 90 or a bit higher, which is a touch above average, and overnight lows in the low to mid 70s, which is also a bit above average. Additionally, precipitation chances will be kept to a minimum next week. One of our medium-range models, the ECMWF, shows very little precipitation occurring around the Memphis region through next week. 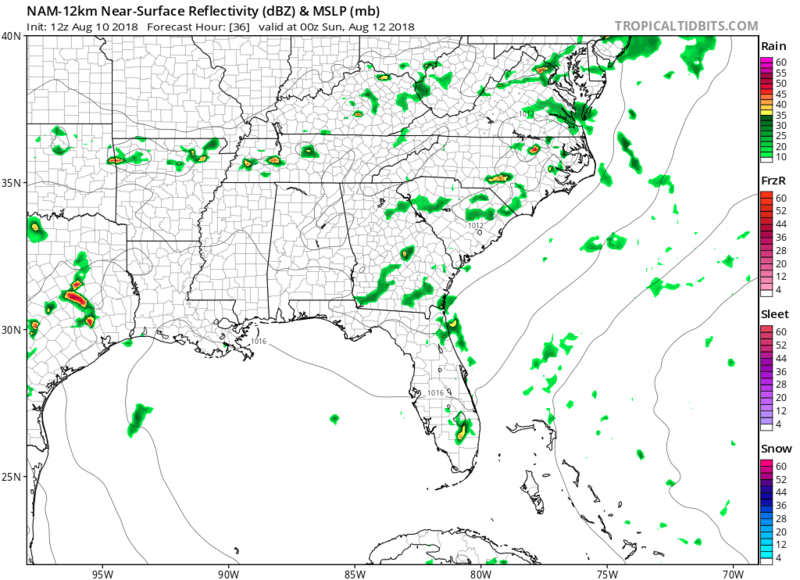 The only exception appears to be isolated chances of afternoon thunderstorms like you might expect in a hot summer airmass. So while it may be a semi-boring weather pattern next week, there is actually a lot going on in the atmosphere to cause this! 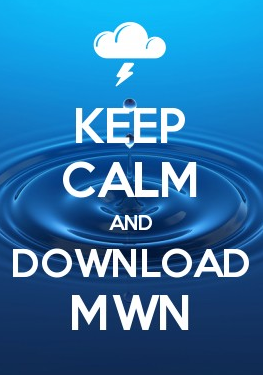 For the complete forecast, be sure to visit the MWN app or our website. Links are provided below. We've got some cooler weather in this forecast, along with a dry spell. 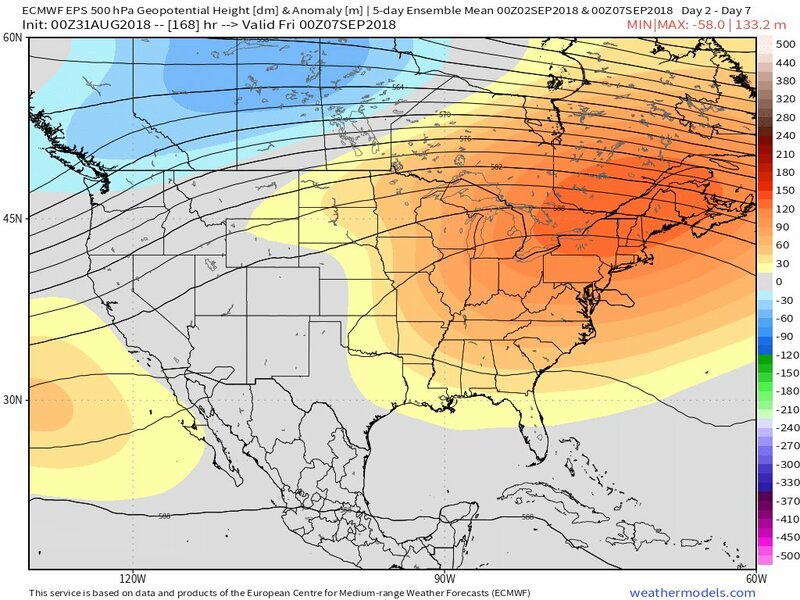 This pattern will certainly give the Mid-South an early fall taste that many will enjoy, before temperatures start to return to a summer style this coming weekend. Thanks to yesterday's cold front that brought a decent amount of storms through the Mid-South, temperatures today will be pleasantly cool. In the wake of the front, moisture wrapping around low pressure to our north will help with the production of clouds that should help limit the amount of sunshine we get, so temperatures for this afternoon are forecasted to only top off around 83 with humidity in the "tolerable" range. Tuesday night, skies clear out meaning that there will be a combo of both less humid air and no clouds to hold in heat, equaling a crisp, fall-ish night/morning for Wednesday. Temperatures dip into the upper 60s for the city, but rural areas could be cooler in the mid 60s. Wednesday through Friday, the forecast remains dry as a high pressure system gradually traverses from the plains, to the Ohio Valley, and eventually for the weekend moving to the Atlantic coast. Until it reaches the coast, that high will help keep flow from the north/northeast, keeping cooler/less humid air in place. Look for highs to be in the mid 80s for Wednesday and Thursday, eventually climbing back to near 90 for Friday. Nighttime conditions, likewise, remain cooler with less moisture in the air: lows will be in the mid to upper 60s each night. Skies Wednesday could still see a few clouds, but Thursday and Friday will both see a good amount of sunshine. All good things must come to an end, and that is the case for the weekend. Flow starts to return from the south starting Saturday. That means we will start to see our humidity slowly start to climb back up, along with our lows creeping back into the 70s. Saturday remains dry with a high in the lower 90s when our humidity first starts to increase. Skies remain partly cloudy through the day and into Saturday night when temperatures only drop to the low 70s. The start of next work week will be very similar to Sunday's forecast. Look for humid conditions to remain, meaning summer is back and in full swing. Temps in the afternoons top in the lower 90s as heat indices approach the triple figures. Skies remain partly cloudy with the opportunity of a select few catching an isolated shower while most remain dry. At night, plan on a few clouds hanging around as temps struggle to drop with lows each night only in the mid 70s. Storms possible through Monday night, then a taste of fall? We've had a pretty interesting weather pattern here in Memphis over the past week. We've had days with above average temps and days with below average temps. Some areas have stayed pretty wet, while a lot of the metro area hasn't seen a drop recently. Luckily, cooler temps do look like they will be hanging around for the next few weeks. Along with that, uncertain rain chances will continue this weekend into the beginning of next week. However, by the middle of next week we will begin to see a pattern shift. If we can just make it until then, I bet you'll all like the rewards that Mother Nature is about to bring. Do you remember yesterday? Well, today appears to be very similar to what we experienced then. Highs will top off around 88 this afternoon with intermittent cloud coverage throughout the day. 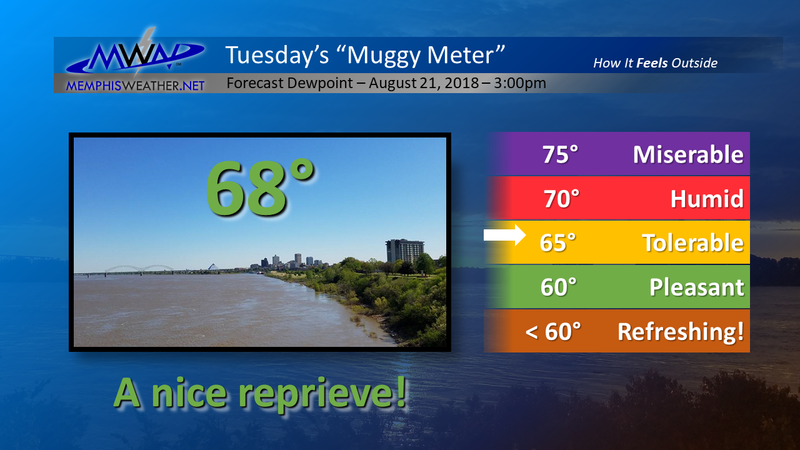 Dewpoint temperatures will coast in the 70s, leaving us with some pretty sticky conditions. As for rain chances, most of us will probably stay dry today, but a shower or two cannot be ruled out. Overall we are expecting for the majority of the showers/thunderstorms to stay to the south of the metro area, but a scattered shower could creep towards us this afternoon into this evening as a weak cold front inches into the area and stalls. Another hot and humid day appears likely on Sunday as the front retreats to the north. Cloud coverage will continue to hang around, but temps will reach near 90 for our high. Dewpoint temps look to remain in the 70s, so expect mugginess to hang around. As for our rain chances, it appears that the majority of us will stay dry through a good portion of the day with the best scattered thunderstorm chances coming in the evening into the overnight hours as low pressure begins to crank up to our northwest. Things will stay pretty muggy overnight with temps only falling to 75. I spy a pattern shift coming on Tuesday, but first we have to make it through a potentially soggy Monday. As a low pressure system develops north of the Ohio River Valley, a frontal system will be set up across the Mid-South, likely bringing some showers and thunderstorms. While we are not expecting a complete washout, we could see a few strong to severe thunderstorms on Monday. Showers and thunderstorms appear possible throughout the day, but any strong storms that develop would likely do so in the afternoon to evening hours and could pose a damaging wind or hail risk. Highs will be near 88 on Monday with 10 to 15 mph winds possible throughout the day. We will continue to keep an eye on the timing of these showers and thunderstorms for Monday. 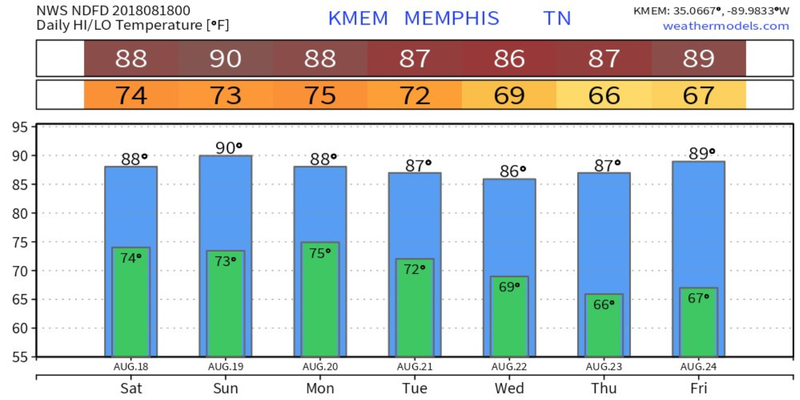 After all of the rain chances and sticky humidity levels we've had recently, the second half of next week looks amazing. Thanks to a cold front passing through early on Tuesday, rain chances will back off to nearly non-existent and things will dry out. Temps will remain below average with dewpoints falling back into the 60s, and maybe even the 50s! It may not feel quite like fall, but it will definitely be nice to catch a break from those high humidity values. Plus a few nights next week will save us some dollars on our cooling bills! The best news of all to share is that below average temps may be here to stay for the foreseeable future. The last week of August and both of the first two weeks in September appear to feature below average temps. 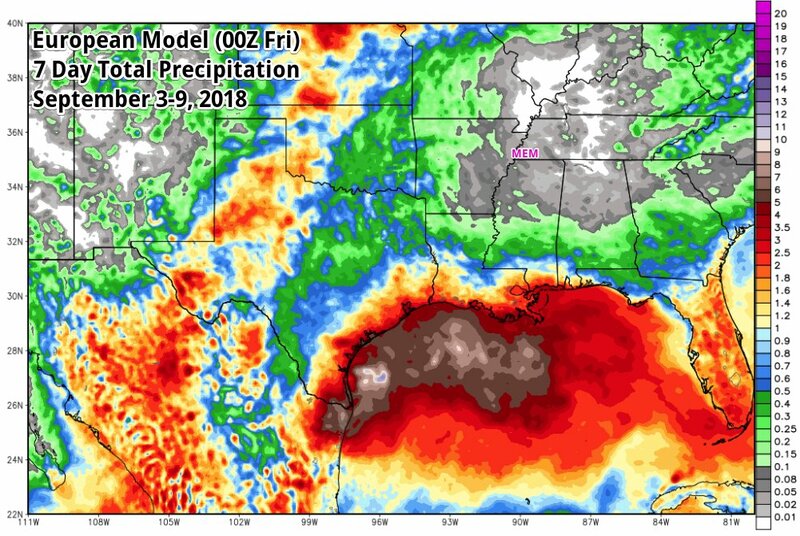 Rain output from the recent stalled front under-performed the past few days. Don't worry rain wanters; we have more shots at showers and storms over the next several days, after today. With that stalled front moving out of here, our skies will be clearing out today. With the return of sunshine, temps will be back on the rise, topping off around 90. As we move into the afternoon, some leftover energy from the exiting front, combined with today's heat, could produce a few isolated storms that last into the early evening; however, most will be remaining dry. Tonight, any storms that could develop will end early on and skies finish clearing out. Despite the clear skies, temps tonight only drop to 72. Sorry, no 60s. If you're wanting to pull off some outdoor activities this weekend absolutely rain free, Saturday morning is going to be your best bet. Clouds gradually trickle in throughout the day and a very weak front starts to dive southeast. Unfortunately, clouds won't move in fast enough to prevent heating, bringing highs to the mid 90s for the afternoon. The inbound front will bring the chance of a few storms mid-late Saturday afternoon. These could last into the evening, and possibly into the early night if enough instability hangs around after sunset. After any remaining isolated storms move out, skies turn clear and temps drop to a low around 74. NAM 12km model at 7pm Saturday shows a few storms moving through the Mid-South along a weak front. 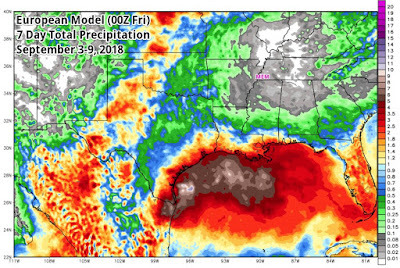 Source-Tropical Tidbits. That weak front that dives south later Saturday will stall out near Memphis, bringing a source to help give some lift for Sunday afternoon storms. So, Sunday will start dry and mostly sunny. As we head into the afternoon, sky conditions turn partly cloudy and we will watch for scattered storms to develop. Obviously by this point in the forecast, summer has returned with yet another day with temps in the 90s. Sunday night, a few storms could be hanging around early on. They will gradually weaken after sunset, bringing back mostly clear skies for the remainder of the night. Temps Sunday night drop to the lower 70s. Monday, the weak, stalled front remains over Memphis, providing enough lift for another dose of isolated storms in the afternoon. Temps will again top off around 90, with partly cloudy skies trying their best to hold off the heat. Monday night, rain chances linger on early, before ending and skies turn mostly clear. Lows in the lower 70s. Tuesday, high pressure ridging temporarily takes over, breaking down that weak, stalled front. Skies will be partly cloudy, with obviously some sun coming in. There is the chance for an isolated shower or storm in the afternoon; however, anything that develops will be purely instability driven thanks to temps warming into the low 90s. Tuesday night, skies will be mostly clear and temps drop to the mid 70s. Wednesday through Friday all look to be similar temperature-wise at the moment with highs topping off in the 90s and nighttime lows in the mid 70s. Wednesday will be similar to Tuesday rain-chance-wise with just another shot at just an isolated shower or storm possible. Thursday and Friday, another front dives south and stalls out across the Mid-South, bringing a new shot at increased rain chances. As a disclaimer, rain chances do increase, but they will remain scattered, so its likely that not everyone will see rain both days and it will not last all day. The month of July ended slightly above normal in the temperature category, but by less than a half degree. While the first three weeks of the month featured only 2 days below normal (and both by a mere degree), a cool spell to end the month helped bring the average down. There were no above average days in the final 10 days of July as a pleasant patter set in, allowing morning lows to reach 70 degrees or cooler on five occasions. No daily records were set during the month. Scattered thunderstorms during the month again resulted in varying rainfall totals. While the airport ended the month above average with exactly five inches of rain, MWN in Bartlett recorded about 3/4 of an inch less. Most rain at the airport fell on only 5 days, leaving large periods of dry weather between. 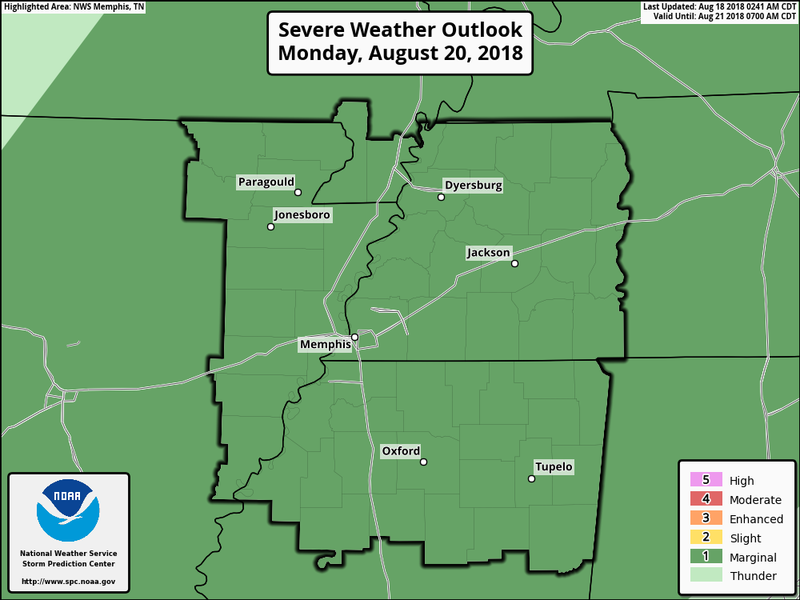 Severe weather reports for the month included trees down and wind damage from scattered storms in Shelby County on the 4th, 5th, 14th, and 15th. 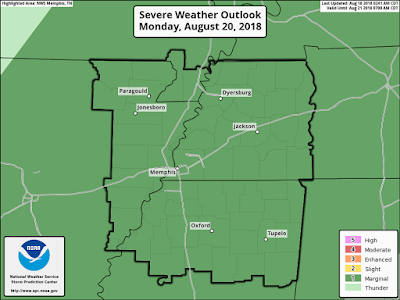 Also, wind damage and hail occurred in Shelby and DeSoto Counties on the 20th, and a very unfortunate fatality occurred on the 14th in Fayette County, in which lightning struck a tree that subsequently fell on an individual mowing his yard. There were also a couple of reports of wind damage in north MS on the 4th and 20th. There were multiple Severe Thunderstorm and Flash Flood Warnings issued for the greater Memphis metro over the course of the month. Comments: Twenty-four days recorded high temperatures at or above 90 degrees, which is 3.1 days above average. Comments: Two days recorded more than 1.0" of rain. Comments: Temperature data was computed for 30 of the 31 days in July. Data was not available due to an equipment outage on the 17th.